There’s a scene about two-thirds into David Fincher’s Zodiac in which David Toschi, the San Francisco homicide detective played by Mark Ruffalo, walks out of a screening of Dirty Harry in disgust, bemoaning the fact that he hasn’t solved the Zodiac case and “they’re already making movies about it.” (A colleague even jokes that “Harry Callahan did a hell of a job” with it.) In the three and a half decades that passed between Dirty Harry and Zodiac, the actual Zodiac was never apprehended, and the case remains stubbornly unsolved to this day. But to mark the 10th anniversary of the definitive Zodiac film — released on March 2, 2007, to critical acclaim, if underwhelming box office — here’s a look at a few other attempts to do the Zodiac’s baffling crime spree justice, at least by Hollywood standards. That’s not the end of the story, though. The Zodiac Killer was not only made to capitalize on the Zodiac’s infamous murders, it was also intended to help solve them by attracting the notoriety-hungry killer to its San Francisco premiere, at which the audience was given comment cards to fill out. The hope was that the Zodiac, whose handwriting and idiosyncratic spelling were familiar to the police thanks to his numerous letters to the papers (including the San Francisco Chronicle, whose reporter Paul Avery, later played by Robert Downey Jr., was an adviser on the film), would fill one out and be identified that way. If he did take it in, though, he apparently chose to keep his thoughts about it to himself. 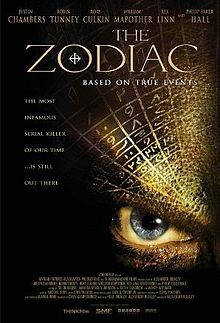 It’s ironic that the most prominent Zodiac-related film until Zodiac came along is also the one that portrays his m.o. the least faithfully. Dubbed “Scorpio” by the film’s writers, the killer in Dirty Harry is a sniper who chooses his targets at random, eschewing necking couples altogether. He still writes letters boasting of his endeavors and making ransom demands, which is how he gets under the skin of lone-wolf homicide detective Harry Callahan (Clint Eastwood), whose rule-bending ways rankle his superiors, up to and including the mayor (John Vernon), whose willingness to play ball with the psychopath to avoid further bloodshed rankles Callahan right back. As this is a detective story first and a character study second, director Don Siegel makes few inroads into exploring the killer’s background or why he does what he does. Instead, Siegel and Eastwood (whose Malpaso Company produced the film) are more interested in the (anti-)hero determined to bring him down by any means necessary. Incidentally, the climax where Scorpio takes a busload of schoolchildren hostage may not have happened in real life, but it is something the real Zodiac fantasized about in one of his letters, which continued coming for a few years after the killings attributed to him stopped. The Zodiac’s last verified letter to the Chronicle, postmarked January 29, 1974, proved he was keeping up with the times (if not his spelling lessons) when he called William Friedkin’s The Exorcist “the best saterical comidy that I have ever seen.” In 1983, author William Peter Blatty returned the compliment by making him a character in the novel Legion, in which his analogue was called the Gemini. 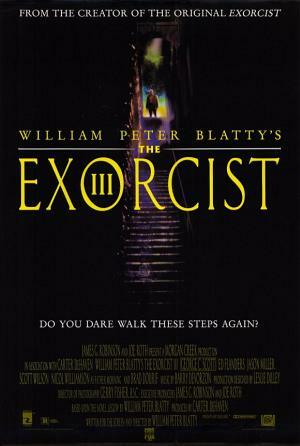 That convention was carried over to Legion’s big-screen adaptation, The Exorcist III, in which it’s repeatedly stated that the Gemini Killer was caught and put to death 15 years earlier. That’s why it’s so puzzling that murders bearing his trademark have begun cropping up again in Georgetown, the beat of Lt. William Kinderman (George C. Scott, taking over the role from Lee J. Cobb, who died in 1976). For his part, Kinderman is still haunted by the death of Father Damien at the end of the first Exorcist, to which Blatty (who also directed) adds a handful of references until the time comes for the studio-mandated exorcism that wraps the whole shebang up. Up to that point, though, he shies away from showing any of the gruesome stuff as he’s much more interested in resolving Kinderman’s crisis of faith and tying the Gemini’s ritual killings to various religious sacraments. As always, the killer’s prime concern, when he gets around to voicing it, is the publicity he believes he so richly deserves. “Are they calling these Gemini killings in the press?” he asks. “You must get them to do that, lieutenant. It’s important.” Almost as important, one imagines, as the Spaceballs reference Blatty awkwardly shoehorns in early on, proving he, too, has been keeping up with the times. 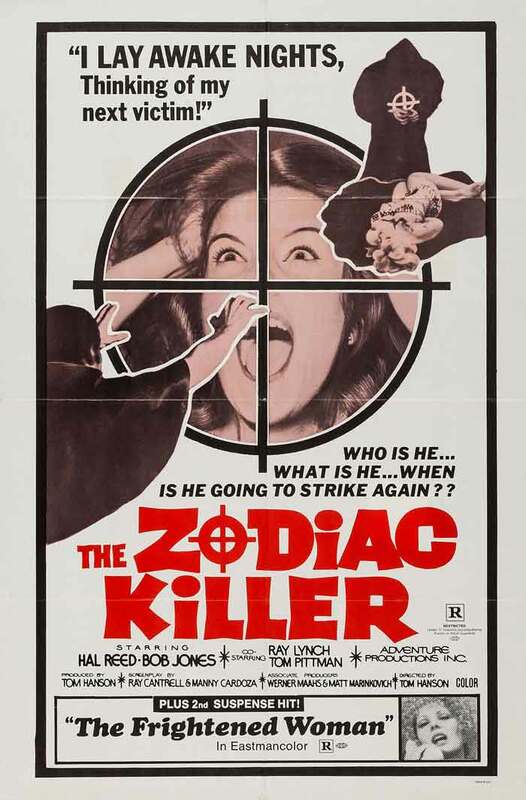 After going into hibernation for 15 years, the Zodiac was back in action in this, the first of Ulli Lommel’s cut-rate films about American serial killers. As the action is set in present-day Los Angeles, the film isn’t focused directly on the Zodiac himself, but rather on an impressionable young nursing home attendant who’s moved to start killing the neglectful relatives of his elderly charges. 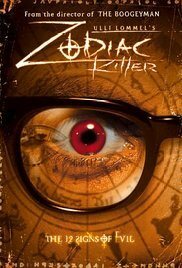 When the local news leaps to the conclusion that his first such act is “reminiscent of the string of murders committed nearly 30 years ago by the infamous Zodiac, a serial killer still at large” and helpfully refers listeners to a book called Hunt for the Zodiac written by Lommel’s character, the budding psycho dutifully picks up a copy and seeks the author out. From there, Lommel the actor takes the young man under his wing and starts molding him in the Zodiac’s image while Lommel the director pads out the running time with clips from his other films, including his first, infinitely better serial killer tale, 1973’s Tenderness of the Wolves. At the same time, he periodically throws in cutaways to a group of men in black hoods who use zodiac-related codenames and call themselves the Jury of Twelve. As it turns out, they also direct the actions of the Zodiac, who is alive and well and whose identity is definitively revealed when he murders his own copycat. In this Zodiac’s eyes, imitation is the sincerest form of annoyance. Hailing from the same year as Zodiac Killer (which was completed in 2003, but sat on the shelf for two years waiting for a distributor to pick it up), The Zodiac was the first film in 34 years to attempt to accurately portray his crimes. Its focus, however, is on Matt Parish (Justin Chambers), the Vallejo police detective assigned to the case, and the strain the investigation puts on his wife and son (played with maximum creepiness by Rory Culkin), who develops a disturbing obsession with the murders. In this way, Parish’s equivalent in Fincher’s film isn’t David Toschi, but rather Robert Graysmith (played by Jake Gyllenhaal), the San Francisco Chronicle cartoonist who becomes consumed by the mystery. Another connection between the two films is the presence of Philip Baker Hall, who plays handwriting analyst Sherwood Morrill in Zodiac and is Vallejo’s increasingly frustrated police chief here. A much more conventionally plotted film, The Zodiac takes all 96 of its minutes to cover the same events that Fincher’s film gets out of the way in about a third of the time, but that gives co-writer/director Alexander Bulkley the leeway to borrow a page out of Charles B. Pierce’s 1976 true-crime film The Town That Dreaded Sundown by including a comic-relief sequence of two male cops posing as a couple while staking out a lovers’ lane in the vain hope of ensnaring the Zodiac. He declined to take the bait, though, and the film ends with an excerpt from a 1978 letter to the Chronicle purporting to be from the Zodiac in which he says he’s “waiting for a good movie about me.” If he was still alive in 2005, all he had to do was hold out for two more years. Craig J. Clark lives in Bloominton, Ind., and is definitely not the Zodiac Killer, nope. Craig J. Clark watches a lot of movies. He started watching them in New Jersey, where he was born and raised, and has continued to watch them in Bloomington, Indiana, where he moved in 2007. In addition to his writing for Crooked Marquee, Craig also contributes the monthly Full Moon Features column to Werewolf News. He is not a werewolf himself (or so he says).